After the age of 20 we slowly start to lose muscle tissue mainly due to a reduced activity level. The older we get the faster the increase in muscle loss. This loss of muscle tissue is known as Sarcopina. This progressive loss of muscle tissue results in two of life’s major problems and is associated with a variety of health related consequences. The first problem is your ability to function physically is reduced, which leads to less activity and further muscle tissue loss. The second problem is when you have less muscle tissue and are less active your metabolism is reduced. A reduced metabolic rate leads to weight gain and all its associated diseases. 12 reasons every adult should do some form of strength training. Unless we exercise properly we lose between 2-3 kilograms of muscle tissue per decade for life. It’s like being a V8 when your 20 and being reduced to lawn mower motor in your 60’s. You can easily see the difficulty in your performance. The muscle tissue that we lose through aging decreases our metabolism by as much as 5% per decade. Those calories that were previously used to maintain metabolically active muscle tissue now go into fat storage. The good news is you are never too old to rebuild muscle tissue. Research has shown that participants in there 90’s increase their strength similarly to younger adults. Studies have shown that we lose 6% of our muscle tissue every decade after the age of 50. Strength training can increase muscle tissue by 12% in as little as 2 months reversing what nature has taken 20 years do. 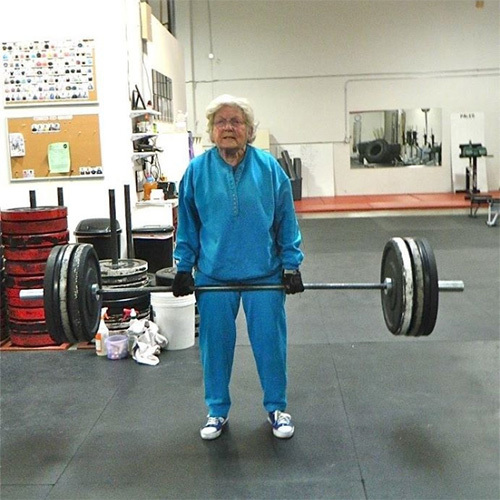 Women lose 12-14 % of their strength every decade after the age of 50 and the same strength training routine can increase their strength by greater than 30%. Again we have reversed 20 years of the aging process. As you rebuild muscle tissue you automatically increase your metabolism. Research has shown that by adding 3 pounds of muscle tissue, your metabolic rate increases by 7%. A higher metabolic rate means you can eat more food and still lose weight. Strength training increases both muscle tissue and muscle tissue activity resulting in an accelerated metabolism and higher daily energy expenditure. A recent study has shown that people whom strength train for 30 minutes 2-3 times per week increased their energy expenditure by 15%. The subjects also consumed 350 more calories per day and still lost more weight than another group that were doing aerobic activities. 6. Increase bone mineral density. Osteoporosis is a degenerative disease caused by a gradual loss of bone protein and minerals. The same strength training stimulus that increases muscle tissue increase bone mineral density. Factors such as genetics, hormones and nutrition play an important role in your bone health; strength training is the activity that will develop a stronger musculoskeletal system. When you increase strength you also increase joint stability and balance reducing the likelihood of falls. Our ability to use glucose is closely related to our risk of developing Adult Onset Diabetes. Exercise especially strength training enhances glucose metabolism. Studies have shown that after 4 months of training, glucose metabolism can increase by as much as 23%. It appears that regular strength training can decrease your risk of developing and improve your condition if you already have Adult Onset Diabetes. 8. Speed up food transit. It takes a certain amount of time for food to pass through your system. The slower it moves the greater the increased risk of developing colon cancer. Research has shown that strength training can increase gastrointestinal transit by 56% in only 3 months. That’s got to feel better. Conventional wisdom tells us that strength training increases our resting blood pressure. This is not true. Strength training exercises either alone or combined with aerobic activities can lower our resting blood pressure. The stronger and fitter you are the less stress is placed on the cardiovascular system. If you have a history of high blood pressure or you haven’t exercised for some time please check with your doctor before commencing any new exercise program. Blood lipids include the bad cholesterol LDL, the good cholesterol HDL and triglycerides. [The storage form of fat] Our genetic make up plays a major role in this area as with diet and exercise. Some studies have shown that combining regular strength training with aerobic activities, reducing dietary fat, increasing fibre may be one of the best ways to create a desirable blood lipid profile. 11. Maintain or improve lower back health. 4 out of 5 people will experience some form of lower back pain. There is a direct relationship between weak lower back muscles and lower back problems. Stronger muscles provide better support and shock absorption, which allows the lower back to absorb greater forces that would otherwise stress this sensitive area. Strength training may be helpful for improving joint function and easing arthritic discomfort. Stronger muscles translate to less everyday wear and tear stress on our joints and improve natural joint function. What normally happens with people suffering from arthritis is that they tend to reduce movement around that joint. This reduce movement promotes further muscle tissue loss and further unstabilizes the joint. The more unstable a joint is the more wear and tear and subsequent discomfort. Can you afford not to strength train? It is always the best advice to seek professional help when beginning any new exercise program. Any exercise will have potential dangers if done incorrectly or too often. Contact a local Physiotherapist or Qualified Strength and Conditioning Coach / Personal Trainer to assist you.